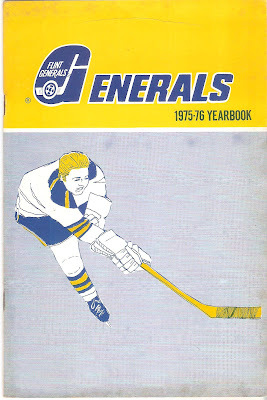 Here's the other Flint Generals yearbook I recently purchased. This one is from the 1975-76 season, the seventh season in franchise history. 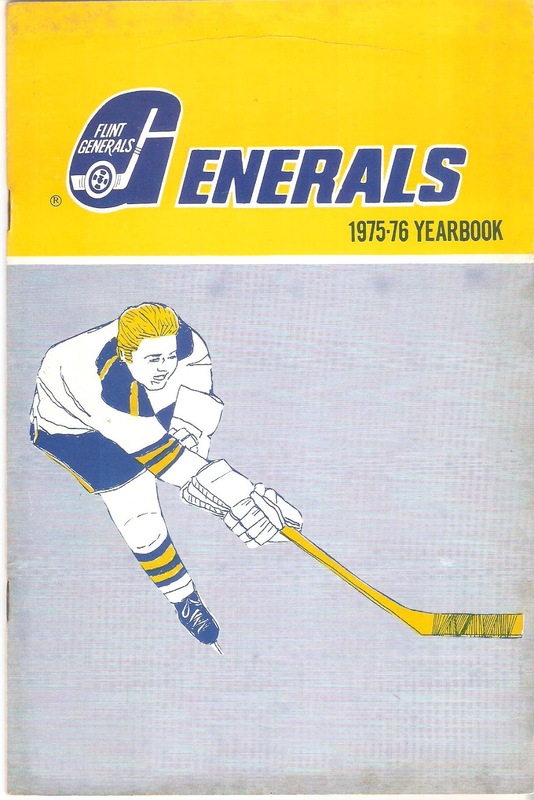 Similar format to the other yearbook, as each of the previous six Generals teams and their statistics are given. Each player from the 1975-76 campaign has their own black-and-white photo with a short blurb about them. Stats for every player that wore the Generals jersey are listed in the back of the yearbook. The 1975-76 Flint Generals would slip to third place in the IHL's Northern Division, with a 34-30-14 record, one point behind second-place Port Huron and one point ahead of fourth-place Muskegon. The Generals would be blown away in Round One of the Turner Cup Playoffs by the Port Huron Flags in four straight. The Flags would reach the Turner Cup Finals, only to lose to the Dayton Gems in four games. Rick St. Croix shared netminding duties with veteran Merlin Jenner. 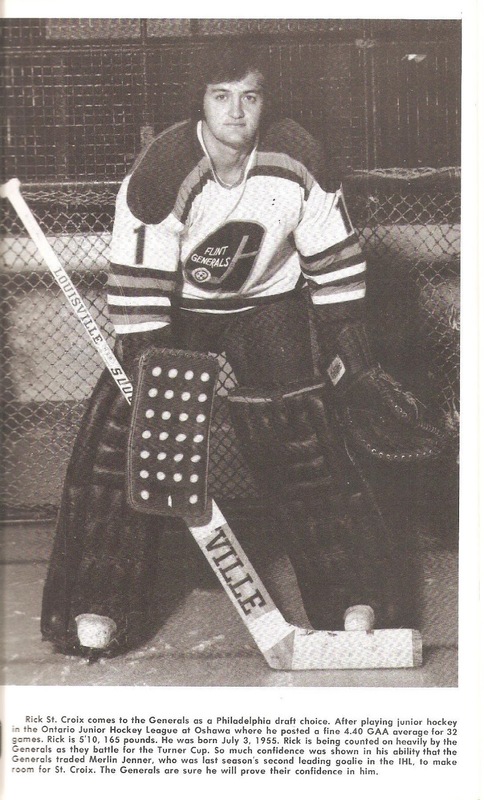 St. Croix played in 42 games that year, and returned as the Generals' starting netminder in 1976-77. His strong play in 1977 earned him a call-up to the AHL's Maine Mariners, the Flyers top farm team, for 1977-78. After playing ten games with Philadelphia in the next three seasons, Ric stuck with the Flyers from 1980-83. His best NHL season came in 1980-81, in which he played 27 games and carried a sparkling 2.49 GAA with two shutouts. St. Croix was traded to the Toronto Maple Leafs during the 1982-83 season. After bouncing back and forth between the Leafs and their AHL affiliate in St. Catherines, he finished his career in 1985-86 with the IHL's Fort Wayne Komets. Detroit native Bob Goodenow joined the Generals in 1974 after two seasons with Harvard University, where he earned his degree in Government and Economics. Goodenow had a fine rookie season for Flint, scoring 18 goals and 39 points in 59 games, along with 66 penalty minutes. Injuries caused his performance to slip in 1975-76, scoring only 7 goals and 26 points in 49 games. While his stint with the Generals was brief, Bob made his mark in hockey after he hung up the blades. Goodenow returned to school at the University of Detroit, graduating in 1979. He replaced disgraced NHLPA head Alan Eagleson in 1992 and kept that job until he resigned in 2005. Goodenow was in charge of the NHLPA during three lockouts, in 1992, 1995 and 2005. After resigning from the NHLPA, he helped form what would become the Kontinental Hockey League. 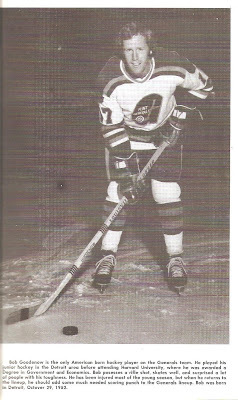 Kirk Bowman played one playoff game with the 1972-73 Generals, then joined the EHL's Greensboro Generals the following season. 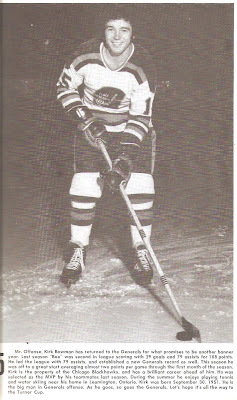 He returned to Flint in 1974-75 and scored 29 goals and 108 points, earning a call-up to the CHL's Dallas Black Hawks in time for the postseason. Back in Flint for the 1975-76 campaign, Kirk had a career season, scoring 44 goals and 107 points to lead the Generals in scoring. After the Generals were swept in the playoffs, Bowman returned south to Dallas, helping the Hawks reach the CHL Finals. After 11 games in Flint, Kirk Bowman reached "The Show", going straight to the Chicago Blackhawks. He bounced back and forth between the Blackhawks and their minor league teams in Dallas and New Brunswick before finishing his career in Europe.